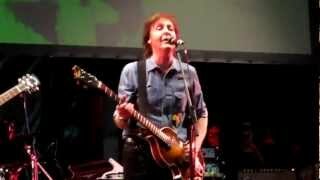 Sir Paul McCartney joined over 80 musicians from Africa, the UK and the US at a concert in London on Saturday night, performing two Wings songs with Africa Express. Earlier in the day, the former Beatle had been awarded France’s highest public award, the French Legion of Honour, for his services to music. He then took the Eurostar back to London, and went the few hundred yards from St Pancras to Granary Square to meet Damon Albarn. The Blur singer has spent the week touring the UK with a collective of musicians known as the Africa Express in a specially chartered train. Following shows in Middlesborough, Glasgow, Manchester, Cardiff and Bristol, the train returned to London for a five-hour gig. The musicians on the train had only been told on Friday that “a very special guest” would be joining them for the show. 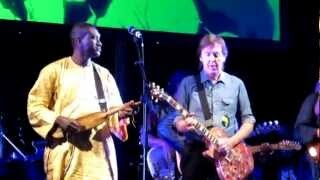 The lineup of musicians joining McCartney, 70, on stage included Albarn, drummer Tony Allen, Gruff Rhys of the Super Furry Animals, ngoni player Bassekou Kouyate, former Led Zeppelin bassist John Paul Jones, the singers Rokia Traore, Terri Walker, Fatoumata Diawara, Martina Topley-Bird, Shinghai Shoniwa and several more. The collective played two Wings songs from 1979, Coming Up and Goodnight Tonight. “It was like a dream come true,” said Diawara after the show. […] The gig feels like a three-day festival squashed into five hours, like all the stages of Glastonbury coming together to jam. Acts you could never have imagined on the same stage playing effortlessly together as if they practiced it for months. Given that it could have been totally shambolic, the freewheeling makes complete sense. The show starts at 6pm and only finishes at 11.30, with everyone on stage to play Amadou’s ‘Masitéladi’. That the list of people on the stage includes Paul McCartney, Albarn, John Paul Jones, Gruff Rhys together with African stars such as Amadou, Fatoumata Diawara, Tony Allen, Rokia Traoré and more makes this feel like a really special occasion. This was the 1st and only concert played at Granary Square. "Hours after being awarded the French Legion of Honour in Paris by French President Francois Hollande, Sir Paul McCartney made a surprise appearance at the closing Africa Express event in London on Sept. 8 to share the stage with an already stellar line-up. 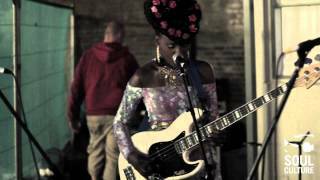 But even backstage special moments were made - as we quietly stumbled across the Beatles legend getting into an impromptu jam session with Shingai Shoniwa [of UK band the Noisettes] and emerging US violinist/singer/producer Marques Toliver."